Last week I found myself in Belgium on duty for StogieGuys.com (more on that in the coming days). When my return flight was delayed, I had time to visit the duty free shop. Despite some claims that it’s the biggest scam in retail you can get some good whiskey deals there, including a number of “travel retail exclusive” offerings. According to the Speyside distillery, “The three expressions in The Balvenie Triple Cask series have been matured in three kinds of wood—‘traditional refill casks’ to mature and mellow the spirit, but not dominate its flavour; ‘first-fill ex-bourbon barrels,’ which add vanilla and coconut to the flavour; and ‘first-fill Oloroso sherry butts,’ which typically impart rich dried fruits and spice to the spirit.” It comes in 12, 16, and 25 year expressions. I selected the 16 year, which cost 72 Euros ($81). Bottled at 80-proof, the color is a dark straw. The nose is pleasant although light with a little oak, honey, and apple. On the palate, Balvenie Triple Cask is a bit thin. There are cereal grains, honey, vanilla, and slightly bitter oak. There’s also a surprising amount of raw alcohol that makes the whiskey taste far younger than 16 years old. The finish is light and sweet with honey and pear. 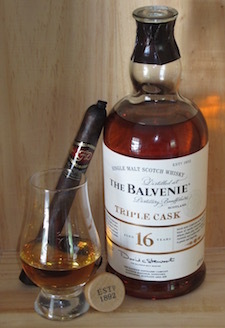 For a cigar pairing, you’re going to want to choose a mild smoke so as not to overwhelm the soft and mild flavors of the Balvenie Triple Cask 16. I’d go with something like an Ashton Classic, Illusione Epernay, Paul Garmirian Gourmet, or Fuente Chateau Fuente. I’ll admit I was quite disappointed with this single malt. Balvenie’s style tends to be very light and smooth, which can be excellent, complex, and delicate, but this was smooth to the point of being a bit dull, plus it had a rough grain edge that is uncharacteristic for a 16 year old whisky. I’d much prefer the standard Balvenie Doublewood, 12 Year Single Barrel, or Caribbean Cask 14 Year to this, especially at the price. Just a reminder to scroll down to the Route 66 review and enter the contest to win an Acme cigar sampler.